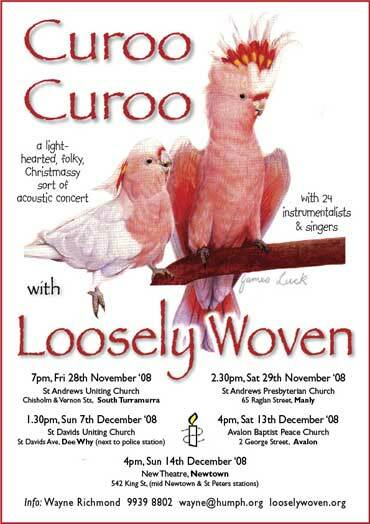 'Curoo Curoo' is the name Loosely Woven have given to their 2008 Christmas Concert. It comes from a carol that former Loosley Wovener Maria Dunn heard The Wiggles perform and which she subsequently turned into an absolutely gorgeous arrangement! The rest of the program covers the usual wide variety of styles including a number of other Christmassy items given the Loosely Woven treatment. On this occasion there will be 27 performers with a wide array of instruments including: harp, four string players (violins & viola), recorders, clarinets, saxophones, flutes (three players this time! 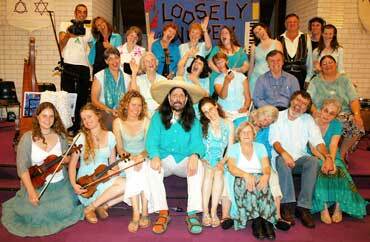 ), guitar, keyboard, concertinas, accordion, keyboard and percussion. See the Loosely Woven web site for details of the program. The Avalon performance on Sat 13th December will be recorded and videod and made into a DVD.